Holds a small amount of text. No Internet required. Links to existing website or part of. Links to existing website or part of with Statistics. Connects to Text stored for you by Visance. Connects to PDF file stored for you by Visance. Connects to Image stored for you by Visance. Connects to Audio stored for you by Visance. Connects to a Video/media clip stored for you by Visance. Appearance - Choice of colour† and size. Templates† - Will be available for multiple printing of a single code. Statistics - Basic level reports how many scans made on the code over a time interval. WiFi Solutions - For when there is poor Internet access. Note: Size is important. 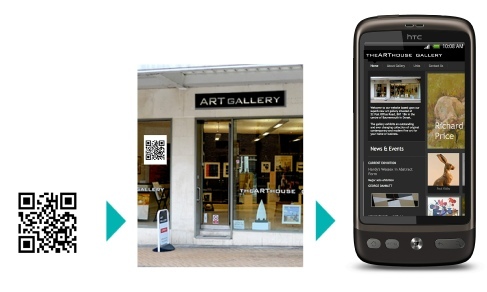 If a large QR code is required for example in a shop window do not generate a small code and then try to enlarge it. It will not work nearly so well. If, for example you are buying a Christmas greeting QR Code for inclusion on perhaps fifty plus cards you will be able to select a template that corresponds to the range of sticky labels available and makes it easy to print up to 21 codes per sheet. There will be no extra charge for this service. If you know the size then definitely go for the PNG as it is good but doesn’t scale well. This is the best option and the one normally offered. The SVG – Scale able vector is an option but it is quite special and you should know what you are doing - check out the special reasons. Visance can keep a record of how many times a code is scanned. 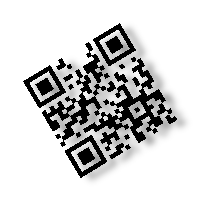 We can provide the details showing for a given period how many scans have been made on a particular QR code. If the QR code is a link to a website Visance can differentiate between accesses to the website through normal channels and those through the QR Code. This could be very useful when assessing the response to an advertising campaign in different areas. Supplying WiFi where there is poor Internet access. At this moment in time we are aware that not everywhere has good Internet connections and although Visance is primarily in the business of generating QR Codes we do have the expertise to help customers who want to embrace the new technology and are having difficulties. We can advise and in some situations provide the environment in which to do so. To be cost effective in the short term we are probably talking about institutions rather than individuals – sorry! But no worries this situation will all be changing for the better very soon. Another simple code is the Link QR Code. These QR codes contain the complete web address (URL) of a page on a website. If Internet access is available the scan will result in the specified page on the website being displayed from where the rest of the website and the web can then be explored. If Internet access is not available the URL can be stored for access later. Once created this QR code link will remain the same and cannot be modified. The Link+ QR Code is the same as the Link QR code except that it links to the customers website via Visance. This means that the QR code can be smaller and more elegant, we can provide statistics and after the QR code has been generated the link can be modified without having to change the code itself. The duration of this code is determined by agreement between the customer and Visance. 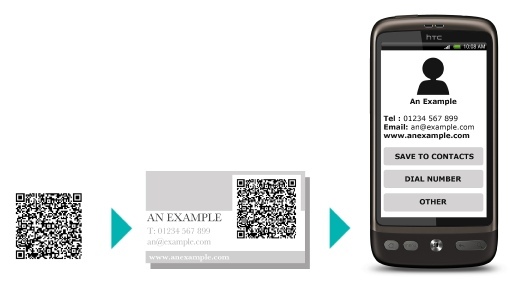 The Text QR code provides a text description or message as written by the customer directly to the user’s phone. It appears like a document with the text wrapping itself to the dimensions of the screen and with the ability to go large for easier reading. A choice of features such as typeface, size and colour are available to customise the text. These QR codes are very useful when labelling an item. For instance a painting in an exhibition where the code is small, discreet and doesn’t distract but at the same time contains information that enhances the viewers’ experience. The same set of QR codes could stay in place even when the exhibition changes. Text will work even with limited Internet access. The duration of this code is determined by agreement between the customer and Visance. When the Image QR code is scanned a picture appears scaled to fit the screen. The zoom function can then be used. A picture QR code could be included on a business or family Christmas card and might for example be a group photo. The content can be updated without having to change the code itself. Pictures require a reasonably quick Internet connection because there is significantly more data to transfer than that required for a text message. The duration of this code is determined by agreement between the customer and Visance. The customer can pre-record a sound file and use this to generate an Audio QR code. The sounds might be voice(s) or music or sound effects and this will play back when the QR code is scanned. The screen would show start and stop messages. It could be a description, a commentary or a message. For this we would advise that they are most effective and best used when used where there is access to WiFi. This will ensure there is a smooth playback. The duration of this code is determined by agreement between the customer and Visance. Text, pictures and sound can be combined to create a Multimedia QR code. The files should be setup and clearly identified before starting the QR code generation to avoid making any mistakes. The Smart phone screen will show the picture and text combined with the sound playing. An instruction on the screen would advise turning up the volume so the phone can be held away from the ear. For this we would most definitely advise they are used where there is access to WiFi. This will be needed to ensure there is a smooth playback. The duration of this code is determined by agreement between the customer and Visance. Using a webcam, camcorder or mobile phone the customer can pre-record a video and use this to generate a Video QR code which will play back when the QR code is scanned. The image will be scaled to the Smart phone screen which can be zoomed in the usual way. We would most definitely advise that these are intended for use where there is access to WiFi. This will be needed to ensure there is a smooth playback. The duration of this code is determined by agreement between the customer and Visance. If the text is complicated requiring an elaborate layout then it will usually be better to submit this as a PDF file and choose the PDF QR code. This will guarantee its exact appearance on all receiving devices. Good examples of how best to use this QR code would be a Curriculum Vitae or a property description. A reasonably quick Internet connection will be required. The duration of this code is determined by agreement between the customer and Visance.